For cryogenic applications of -100°C and below requiring "super" insulation, evacuated perlite provides a superior insulation with thermal conductivity up to 40 times less than 0.029 W/m.K depending on vacuum and temperature. Usual applications for evacuated perlite insulation are in double walled helium and hydrogen storage spheres. 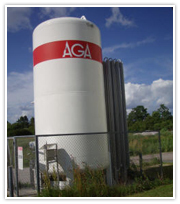 It also may be used for storage of oxygen, nitrogen and LNG when especially low thermal conductivities are desired. In addition to large field erected storage tanks, evacuated perlite is used to insulate smaller shop fabricated vessels designed for the storage of many of the cryogenic gases. Perlite insulation suitable for evacuated cryogenic service exhibits low thermal conductivity throughout a range of temperatures, pressures, and densities. The normal recommended density range is 125-150 kg/m³. Cryogenic temperatures are generally considered to be below -100°C. Thermal conductivity of evacuated perlite is many times lower than that of nonevacuated perlite insulation. For example, at a mean temperature of -82°C, normal unevacuated cryogenic perlite at 64 kg/m³ would have a thermal conductivity about 22 times as great as evacuated perlite at 139 kg/m³ and interstitial pressure of 10 microns. In addition to excellent thermal properties, perlite insulation is relatively low in cost, easy to handel and install, and does not shrink, well, warp or slump. It also is noncombustible and meets fire regulations. Perlite for evacuated service must be dry. The normal moisture limit is 0.1 percent by weight. Moisture in the perlite greatly increases the pumpdown time necessary to achieve the low vacuum required. As a result, perlite must be fresh and packaged in moisture-proof bags or sealed tank trucks. Perlite bagged in paper sacks should not be used. Field installation of perlite "super" insulation for large evacuated cryogenic vessels requires that a vacuum be maintained in the annular space of the vessel being insulated. Expanded perlite is pressurized with nitrogen in a tank truck and drawn into the annular space by a combination of vacuum and pressure. For small vessels, where vacuum transfer is not practical, direct conveying of dry perlite by means other than vacuum, under strictly controlled conditions, produces satisfactory results.